Cortana is Microsoft’s answer to Apple’s Siri, Google Now, Amazon Echo and other voice activated intelligent personal assistant. Microsoft Cortana is an intelligent digital personal assistant developed for multiple devices and operating systems, such as Windows Phone 8.1, Windows 10, Xbox One, iOS and Android. 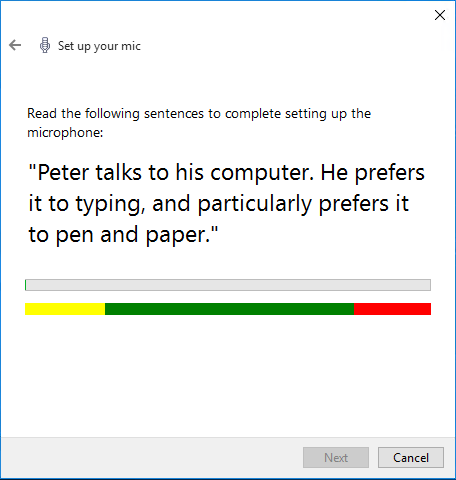 With the inclusion of Cortana in Windows 10, you can now effectively “talk” to your computer or PC for greatly enhanced user experience. In fact, Cortana works not only through ‘voice’. You can always type in the command if you prefer to silently ask Cortana to do task instead. Cortana allows users to set reminders, answer questions using information from Bing (e.g. weather conditions, traffic statuses, sports scores, and biographies), browse the Internet, launch programs, send emails, search for files, recognizes music, and perform many other tasks including play a joke, by simply speaking with natural voice as voice command without having to input a predefined series of commands, which Cortana automatically recognizes. In addition, Cortana also has ability to integrate with other services, such as Foursquare to provide restaurant and local attraction recommendations, with the supported third-party services surely set to grow over time. 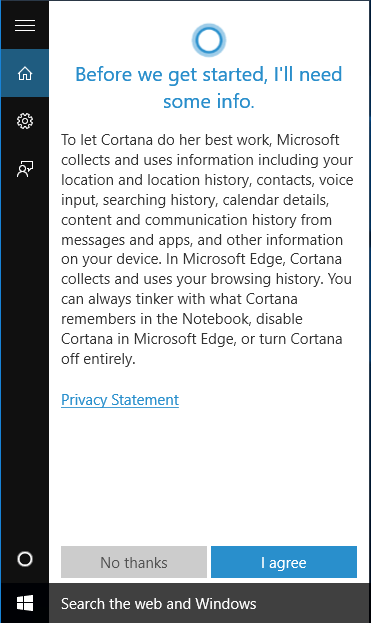 Of course, running on PC, Cortana is able to accept command input through keyboard, and Cortana also saves all the information in an at-a-glance panel known as the Notebook, making it potentially superior to other voice activated intelligent personal assistant. 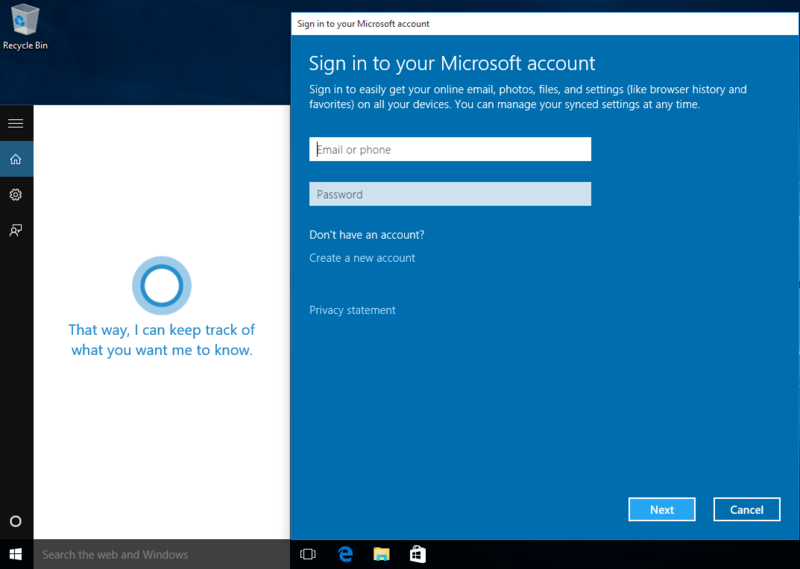 Enabling Cortana in Windows 10 is extremely easy. In fact, during the initial setup of Windows 10 right after you turn on the new device, clean installation or resetting Windows 10, user would be presented with option to enable Cortana right away. Cortana is only currently available on Windows 10 for the United States, United Kingdom, China, France, Italy, Germany and Spain. Microsoft plans to expand its support to Japan, Australia, Canada (English and French), India (English), Brazil and Mexico by end of 2015. You can workaround the restriction to make Cortana works in unsupported region and language. On the Taskbar, locate and click or tap on the Search button or Search box. 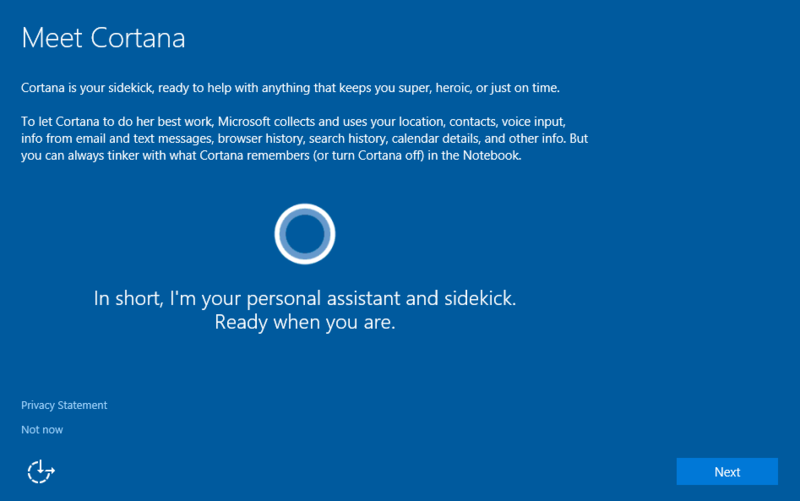 When the Search Windows pops up, you’ll be asked whether you want to turn on the Cortana. Click or tap on Next button. If you hide the Search button on the Taskbar, simply open the Start menu and type anything to bring up the Search Windows dialog. Then, go to Settings menu (Gear icon), and slide the toggle for Cortana can give you suggestions, ideas, reminders, alerts and more to On. Accept the privacy statement by clicking or tapping the I agree button. 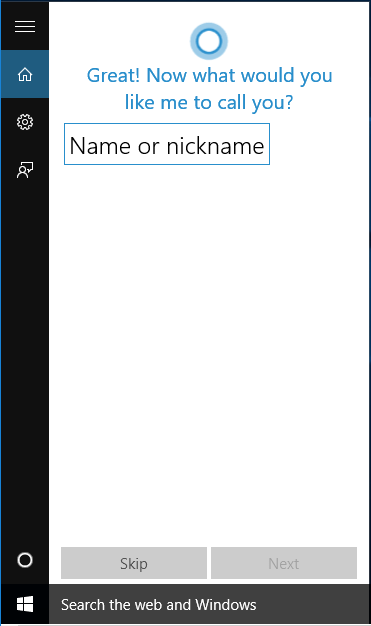 Enter a name or nickname that you want Cortana to call you as, then tap or click Next button. You can also tap or click on Skip button to bypass entering of a name. 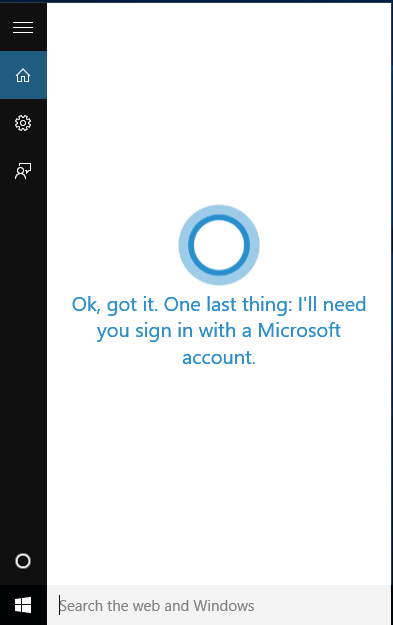 Cortana must be used with a Microsoft Account (MSA). If you haven’t used Microsoft Account to sign into the PC, you’ll be prompted to log on with a Microsoft Account. Since Windows 10 Version 1607 Build 14393 (Anniversary Update), signing into Microsoft Account is optional, and only required if you want to use some personalized features such as Notebook. 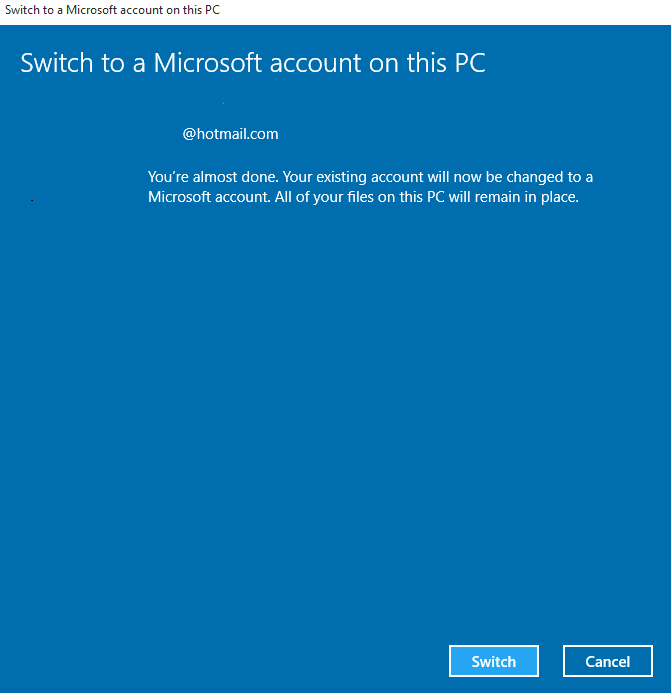 After signing into Microsoft Account, click or tap on Switch button to change existing account to Microsoft Account. Cortana is now enabled. The wizard may prompt you to select interests that suit you, which you can safely ignore. In addition, depending on your privacy settings, you may be prompted for access to use your location or to enable the location services. It’s recommended to allow Cortana and Search to use your location to give you better results. From now on, the Search in Windows 10 is essentially done by Cortana. You will notice that the Search text and icon on the Taskbar and elsewhere is now replaced by Cortana text and icon. 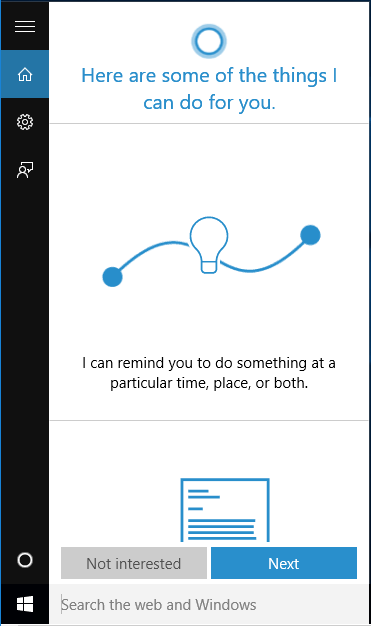 You can start typing to ask Cortana to do the tasks, or click or tap on Mic icon next to the Search box to use your voice to give instruction to Cortana. The very first time you’re using voice command through microphone, you will need to let Cortana learns about your voice so that it can recognize it properly. 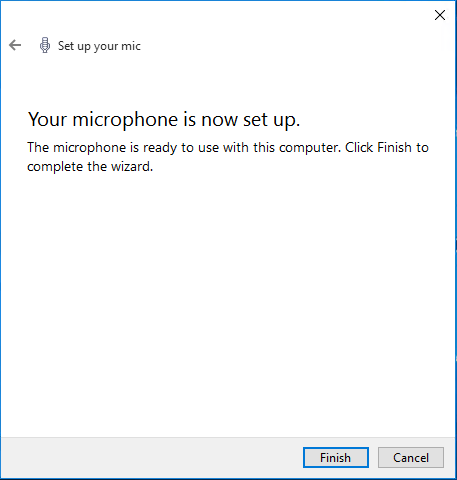 A wizard is automatically pops up which asks you to set up your mic. 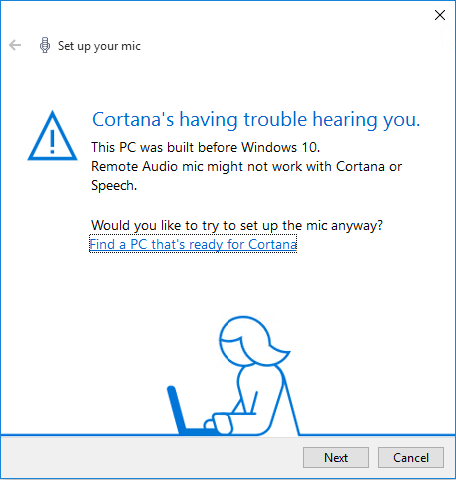 If you’re prompted with warning that Cortana’s having trouble hearing you due to this PC was built before Windows 10, click or tap on Next button. 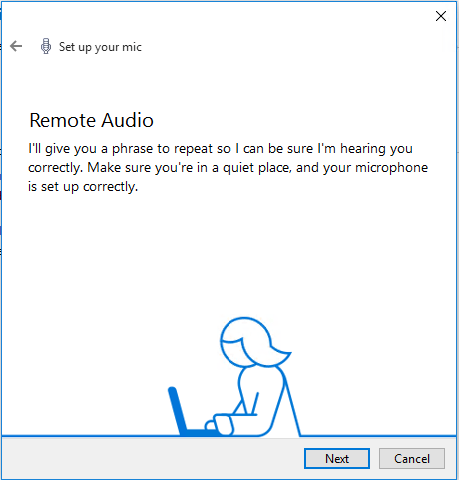 Read through the instruction on how to set up your mic for Cortana, then click or tap Next button. Read the sentence. Ensure that there is no other noise in the environment. When done, the wizard automatically proceed to the final screen to confirm the readiness. Click or tap Finish button to exit and start using Cortana via voice. If you want Cortana always ready to accept voice commands without having to click or tap on Microphone icon, enable Hey Cortana. 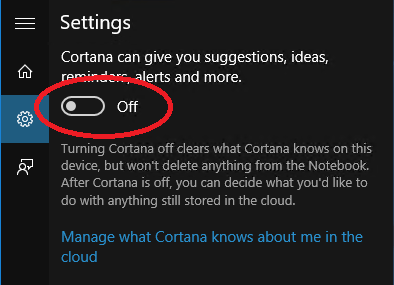 Also, you can disable and turn off Cortana if desired.